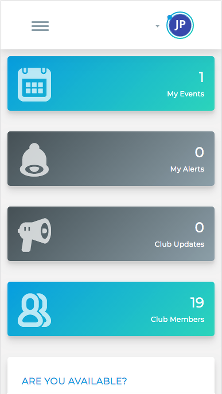 Manage your cricket club faster and smarter! In a hurry? Watch this quick tour of Cricket Club Manager. Let us help you with the planning. Easily communicate news and last-minute changes to players with push notifications. Instantly remind players of important updates, upcoming events and overdue tasks. Save time by knowing players' availability. CCM allows players to confirm availability for each match with push notifications. Players also have the options to proactively indicate their availability. Quickly and easily create matches and practices with intuitive controls like a date/time selector, availability indicator, venue selector and much more. CCM makes it easy to create teams, select players, designate roles and replace players on a team. Best part is you can create and save unlimited team rosters with this feature. Never again miss a celebration moment with your team. Create social events, award ceremonies and other gatherings easily with our Event Planning tool. Post venues for matches and practices with links to maps and directions. 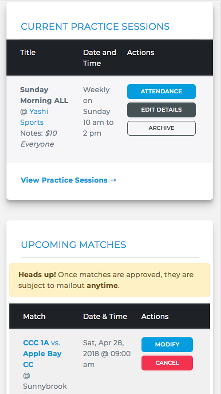 This integrated feature will help players get to matches and practices on time and help minimize no-shows. Instantly approve or decline new members and manage registered members. CCM simplifies all aspects of club management from tracking attendance at matches and practices to fee payments. Players can create their complete profiles to showcase their cricketing skills, talents and hobbies. They can also provide their In-Case-of-Emergency (ICE) contact. No more reading through long messages on groups chats to figure out where my next game is or what’s changed. The CCM app gives me updated information, instantly. I highly recommend CCM to all cricket club administrators and players. Our players come from Kingston, Montreal and Ottawa - and it used to be so difficult to coordinate player availability and match schedules over texts or messaging apps. Now all the players simply log on to CCM, check our upcoming matches and venues and provide their availability - no more last minute surprises! The app is simple to use. My schedule changes often and with the CCM app I can quickly update my availability for upcoming matches. Saves me lots of time and avoids frustrations! No one likes fees. We get it! That’s why our plans are affordable for all clubs. Got more than 250 players? Please contact us for a quote. 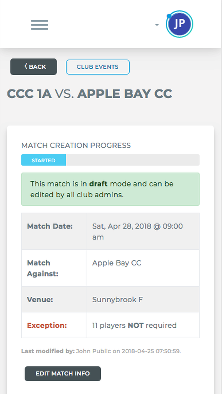 Cricket Club Manager started as a small project in 2016 to help one club in the Greater Toronto Area resolve their day-to-day administrative challenges. Our target was simple, make administrative tasks seamless, provide instant information access to all players and free up time spent on planning to make more time for cricket. Our tool became instantly popular with cricket players, which led us to partner with several clubs across Canada. Responding to the resounding popularity and demand, we decided to make Cricket Club Manager available to all clubs, big or small. Our development team works closely with our partners to build new features on a regular basis. We also actively welcome feedback from our growing user base. We are committed to our rapid development strategy and aim to roll out at least 2 to 3 new features each week.